The WDHS History Department traveled to Germany, Poland, Russia & the Czech Republic Friday, March 11th, to Tuesday, March 22nd, 2011. The Waterdown District High School History Department has a long tradition of excellent trips to such exotic locations as France, Cuba and Egypt. Following the successful 2008 Battlefields of Europe trip (France, Belgium & Holland) the 2011 Eastern European Tour explored the history and locations along the eastern front, including some of the darkest chapters in our collective history. 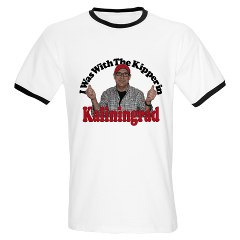 As promised, t-shirts commemorating the historic entry of the first Canadian into Kaliningrad Oblast have been made and are available at http://www.cafepress.ca/Yesteeyear/7790344. 7:15am (local time) - We are in Prague International Airport waiting for our 8:15am flight to London (Heathrow). We are anticipating a four hour layover in Heathrow before boarding our flight for Toronto. 1:05pm (local time) - We are at Heathrow International Airport waiting for our flight to Toronto (AC 849 departs at 3:00pm London time). There was some confusion and the airline (not EF tours) did not check our bags through to Toronto causing us to have to go through customs here to collect our bags and then check back into the airport. Technically, we toured England for an hour! No worries though - everything is fine now as we await our flight. 7:40pm (Toronto time) We are all safely back in Canada! Our bus will be here to pick us up for 8:30pm, which will put us at WDHS for approximately 9:10-15pm. Everyone is excited to be home, with lots of pictures and stories to tell! Again, you should be so proud of your kids - they were fantastic on this trip. It was nothing but sun today as we toured Prague. Starting at Prague Castle (the largest palace complex of its kind in the world) we weaved our way through the streets (past a winery! 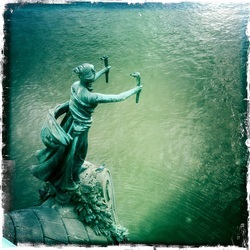 ), across the Charles bridge and into the Old City. The president of the Czech Republic was in residence at the Castle and we had a brilliant group picture, Ryan Wallace's Flamborough Review front and centre, with one of the presidential guards. The afternoon was spent in the shops buying last minute souvenirs and gifts. The fair from the previous day was in full force. Before heading back to the hotel we took a final group picture with a massive Czech flag to give to Mr. Flosman. This evening was our farewell dinner, and the students all dressed up to give Wes a big thank you. Adam and Jacob composed a song for Wes (as well as Josef, our Czech bus driver). Sharon, Alex and Jamie wrote a great poem dedicated to our favourite Irishman, Sharon going on to entertain us with some impromptu juggling. I am really proud of our students - they represented our school and country so well. The end of a trip is always bittersweet, and this is especially true for this one. I would happily take any of these students on a trip again - in a heartbeat. Happ Birthday Lauren!. It was another long travel day (approximatley 8 hours) to the capital of the Czech Republic. Arriving at 3pm, Wes took us on a walking tour to the old and new squares of the city. Coincidentally a fair was in full swing and the smells of kobasa, sausage, rye bread and liquorice filled the city. There was also tree men playing music and the square was alive with people dancing and eating. I think it is safe to say that the kids fell in love with Prague immediatley. Personally I bought a kobasa off a man who was the spitting image of Mr. Flosman! Our hotel is part of a new stadium - some of the girls watched a soccor match out of their room window! It was snowing in Kracow when we woke up this morning - exactly like the scenes from Schindler's List. Everyone was quiet as we drove 80 minutes to the town of Oświęcim arriving at Auschwitz I (the original camp). The museum is very well laid out, beginning with a short film about the camp and what went on there. We were divided into two groups, both with excellent guides that walked us through rows of brick buildings and rooms filled with shoes, pots & pans, and glasses. One room even showcased toodler's shoes and outfits - unless they were twins (used for medical experiments by Josef Mengele), children were immediately gassed. We saw a reconstructed gas chamber and cremetorium - a few had a difficult time in this room. After touring Auschwitz I we boarded our bus for Auschwitz II (aka Birkenau). It was here that Hedy Bohm was held from 1944-45. Leaving the bus, one of the students came up to me and said that he had purposley worn ony one layer of clothes so that he would feel cold today. Cards were handed out so students could write a message to Hedy - I will post them to her when we get back to Canada. The names of Hedy's parents and best friend were also given out. It was cold today (around -1C). It was also wet which made the camp that much more real to everyone. We walked through a few of the cabins, and then down the platform toward the back of the camp (where the gas chambers were located). Halfway down the platform we realized that we were on the spot where Hedy had last saw her mother and father. We looked down the road that Hedy headed to be processed and admitted into the camp, and we also saw the path that continued to the back of the camp. Some of us lit our candles there - sheilding them from the wind - in memory of Hedy and her parents. At the back of the camp are the remains of the large gas chambers and cremetoriums (destroyed by the fleeing Germans the ruins stand as they were found by the Soviets in 1945). Candles were lit and everyone took some time to reflect on what that place was and what their responsibility would be when they returned home to Canada. As the guide said to us: this happened because one group of people thought that they were better than another. Slowly people returned to the bus - stopping to buy some literature in the small shop on the property. The afternoon was turned over for free time in Kracow for shopping and sightseeing. Some went to see the beauitiful Royal Castle, while others stayed at the hotel to write in their journals. More time was given in the evening for everyone to digest the events of the day. Honestly, I don't think most of the students have processed what they saw - I know a few have mentioned that they wanted more time at the camp (as it was, we were there for 4 hours). It is hard to really put into words what a place like Auschwitz-Birkenau is. It is a place that evokes feelings of anger, outrage, confusion and disbelief. Some students were upset that they did not react more emotionally. Some wept, and others said nothing. I am sure they will want to talk about this place when they are home with you in a few days' time. Much of today was spent on a bus traveling from northestern Poland to the south and Kracow. The weather was grey and wet. For part of the 11-hour trip we watched Steven Spielberg's masterpiece Schindler's List - that we were driving through the country that the movie was set in combined with the weather outside to create a mood that is hard to describe. Set in Kracow, the movie prepared us for what we are going to experience tomorrow. We arrived in our hotel - located within the Old Town - at 7pm. Wes took us for a visit to the town square after dinner, and we were all in bed for 11pm. Tomorrow is a big day for us, and you can tell by the sombre mood in the hotel tonight. What an adventure! It was an early departure from Warsaw that had us walking toward the Polish border (our bus was not authorized to cross into the Russian frontier, so the kids had to board a Russian bus). We didn't get too far before a guide and bus from Kaliningrad picked us up and took us into customs. The school had sent an e-mail offering a prize to the Canadian that could accuratley guess how long it would take us to clear the border - Sharon Millar won with a guess of 1 hour and 46 minutes (her prize was a bag of amber collected along the Baltic Sea by one of the Russian students). The guide informed us that we were officially the first Canadians ever to visit Kaliningrad City. Keith `The Kipper`Archer was the first Canadian to enter Kaliningrad. The drive into Kaliningrad was an eye-opener - abandoned farmers` fields (the economy collapsed after the fall of the Soviet Union), bridges destroyed by the advancing Russians during WWII, and countless deserted villages. A quick (and cold) tour of the city had us paying respects at the grave of philosopher Immanuel Kant and gazing at the horrendous House of the Soviets (infamous as the world`s ugliest building). Kaliningrad is a strange place - the citizens are trapped there (they need visas to get into neighbouring Poland and Lithuania which they must cross to get to the rest of Russia). During the tour we were informed that the largely Soviet population had recently added an Indian from Mexico to their ranks. After dinner we walked down to victory square (commemorating the end of their Great Patriotic War - World War Two). This morning we were picked up by students from a local school for English and diplomacy. Aged 15-18, these students were the grandchildren of the original settlers ordered into the region by Joseph Stalin in 1945. We divided into two buses allowing almost every WDHS student to sit with a Russian student. Everyone talked together (talking about each others`countries, facebook, and travels). Alex Webb particularily enjoyed her time with her Russian partner. We drove to the Curonian Spit, a beautiful strech of sand dunes that shoot out into the Baltic Sea, separating it from the Curonian Lagoon. It was an amazing moment - the Russian teacher was in tears (such a meeting of students would have been impossible during the Soviet Era). Pictures were taken and an official flag exchange (thanks to the Wallace family, David Sweet MP, Ted McMeekin MPP and Judi Partridge for supplying flags and pins for us to give out). The sun shone brightly as our kids dipped their feet into the Baltic Sea, collecting sand and skipping stones off the water. We drive back into Kaliningrad and kids were given free time to spend with their new friends - the Russian students taking them to various shops to buy souvenirs and get some lunch. We finally had to leave and the Russian teachers and students waved us off as we headed south for the Polish border. E-mails were exchanged and relationships and memories that will last a lifetime were created. Our students represented Canada well. A huge thanks is owed to Wesley Lawler (our tour director) for ensuring the success of this visit. It took two hours to cross back into Poland - students admiring their Russian passport stamps. Our Polish bus picked us up along the border and drove us to the Wolf`s Lair (Hitler`s Eastern command post during the second world war). Hitler spent 800 days at this massive complex of bunkers highlighting the fact that we do not spend near enough time learning about the eastern front (over 25 million citizens of the USSR died between 1941-5). We had a brilliant tour guide who guided us through the East Prussian forest, even taking us INSIDE Hitler`s bunker - literally chilling as the moon hung over us and the forest closed in. A Polish general is visiting tomorrow so various transports were constantly entering the park - it added a reality to the place. The kids were quiet as we drove to our hotel here in Ketrzyn - processing the events of the past 24 hours. Kaliningrad is the least visited place in Europe and a community truly at the mercy of its history. We visited the spot where Hitler`s body was found in Berlin and now have walked down the same dark halls that he paced for 800 days during the height of the war. Now we travel south to Kracow to learn about what was going on behind the frontline. Our day began with a guided tour of Warsaw's many embassies, parks and historical sites. It is heartbreaking to learn about the level of destruction brought upon this city. Every major landmark seems to be a reproduction of one destroyed during WWII. Stopping at the Jewish cemetary the students chatted and joked around until the weight of the area hit them - this was especially true when we reached the mass grave of the 100,000 bodies discarded from the Warsaw Ghetto. The air in this space was heavy. Free time in the afternoon allowed for exploration of the Old and New towns, as well as some shopping. We gathered for a walk over to the tomb of the unknown solider (protected by the only part of a great palace that was not dynamited by the German army) and finally the Cultural Palace. Most of the students went to the top of this imposing hulk for views over the city. As a group we decided to go out for a local dinner of perogees. After our meal instructions were given out for our great adventure into the Russian Federation tomorrow. After a six hour bus ride to the border we will cross over by foot into Russia where we will board a bus sent from Kaliningrad. Our tour guide has confirmed that we will be the first group of Canadians to enter the city. Olga the teacher will meet us at the hotel to prepare us for our day with her students on March 17th. Last night we were joined by Jamie Kosonic, who traveled to us after representing Canada in syncro-skating at the World Competitions in Switzerland. Boarding a train in Berlin, we sped across East Germany, across the Oder River and into Poland (dropping off Nicole Brandt in Poznan). Arriving in Warsaw, students were greeted with the monolithic Palace of Culture (a gift from Stalin to the people of Poland in 1955). After loading our new bus with suitcases, we set out to walk to the old town of Warsaw (painstakingly rebuilt after the city was destroyed by the retreating German army during the second world war). Postcards were bought, and Nick may have become the newest celebrity on Polish television! Room checks have beem done at our hotel, the Alto (a converted Soviet apartment complex on the outskirts of town), and students are asleep. What a day! 13C and sunny - a perfect day to explore the city. We started with a bus tour of the city (including stops at the Brandenburg Gate, Holocaust Memorial, the Fuherbunker & Berlin Wall) that ended with free time to explore Checkpoint Charlie (multiple students purchased mock-Russian hats). The afternoon was spent at the Jewish Museum of Berlin - a brilliant building designed to have its guest "experience" the chaos and confusion of the Jewish experience in Germany. We also met up with Nicole Brandt (a former WDHS student who is attending university in Poland) who spent the rest of the day with us touring the city. We then walked across the city (using public transit) to a Russian restaurant for dinner. It is 9pm now and the students are packing their bags for our train trip to Poland - we have to be up at 4:15am to catch the train. Everyone is safe and sound at the hotel. The first group went out for dinner in East Berlin - eating in a renovated mall (built in the 1950s). Unfortunately, the second group missed dinner so they are ordering pizzas. We have a big day tomorrow - lots to see and do in Berlin. We have arrived safely, but discovered that British Midlands has overbooked our flight. This means that 9 students and 3 adults have to wait 3 hours for a later flight. The first group will depart at 2:10pm (London time) and the second group at 5:10pm. Once we arrive in Berlin, the groups will meet at the hotel for a German dinner and early night to bed. Everyone is doing well, albeit a little tired. Click on this image to be taken to the business' site. The designer is a Waterdown resident.